2BR 2BA Saint Germain (rue de Tournon) Se luksus Ac !!! Denne 80 kvadratmeter (861 kvadratfod) to-værelses to-badeværelse lejlighed er beliggende i en charmerende og nyrenoveret fem-etagers byhus, få skridt fra Saint-Sulpice, Saint Germain des Prés, og den dejlige Jardin de Luxembourg. Huset er fundet på en af ​​de mest prestigefyldte adresser i Paris - den elegante, rolige, brede og meget sikker Rue de Tournon (også hjemsted for det franske senat og Garde Républicaine). Der er kun to boligenheder på de øverste etager af denne bygning, og begge tilhører samme ejer. De nederste etager er besat af en diskret kunstgalleri kun åben efter aftale. Denne lejlighed blev fuldt renoveret for nylig af en indretningsarkitekt med de fineste materialer og finish, herunder en top på den linje lavet efter mål køkken med Lacanche komfur, granit bordplader, antik eg og skifer gulve, fritliggende træbjælker, brugerdefinerede træ bibliotek, og luksuriøse badeværelser færdig i travertin, antikke teak gulve, tumlede marmor fliser, og med Horus vandhaner. Der er aircondition i alle værelser. Denne enhed ansigter fuld vest og stuen er oversvømmet med solskin hele eftermiddagen indtil solnedgang (som forekommer omkring 10 pm i sommeren!) Værelserne er rolige og står over for en indre gårdhave. Det kan sove op til 5 personer (herunder en sovesofa til én person). Bemærk, at det andet soveværelse og badeværelse har en separat indgang på den samme landing, som du kan se på nedenstående plantegning. • Centralvarme (vandvarme) til dem, der foretrækker traditionelle franske "radiatorer"
Denne lejlighed er ideelt beliggende midt i det bedste, den venstre bred har at byde på! Rue de Tournon er en fortsættelse af den meget centrale Rue de Seine, som løber gennem hjertet af St. Germain des Pres. De nærmeste metrostationer er Odeon og Mabillon, begge som er en 2-3 minutters gang fra lejligheden. Den smukke Jardin de Luxembourg er et minuts gang væk fra lejligheden, som er den Eglise Saint-Sulpice. Carrefour de L'Odeon er en to minutters gang væk, og lidt længere (fem minutter til fods) er Eglise Saint Germain og Café de Flore. Rue de Tournon er en af ​​de smukkeste gader i Paris, også hjemsted for det franske senat, det Garde Republicaine og Bonpoint butikken! Vi er et skridt væk fra den dejlige Jardin de Luxembourg, hvor du kan gå, jogge eller bringe dine børn på legepladsen. Everything was fantastic! Thanks all! No better area to stay while in Paris, and this home is a real treat. Four of us, two adults and two teens, stayed here for a week while we visited Paris. I had no foreknowledge of which areas of Paris would be best to stay in, which is why lady luck was shining on us when I chose this property. Our first day of the visit we were met by our tour guide, who asked us who we knew that lived in this area. Soon we realized why we were asked that question. This property is in a quiet, safe, exclusive part of Paris, with the most elegant shopping and cafe's in the city just minutes away. We walked nearly everywhere and loved every minute of it. As for the home itself, you'll love it. There are two separate bedrooms, great for our kids who wanted privacy, and a very comfortable living room. We watched Midnight in Paris on our first night there, all sitting on the couch, eating the cheese and baguettes that we purchased at the market, and I must say it was terrific. The WiFi is fast, and Choi, the man that tends to the flat, is great. He and his wife Amy would come each day while we were out and do light cleaning, and they were always there for us if we needed help or had a question. Ludovic, the owner, is truly a great property owner. Communications were always fast, and he sincerely worked hard to help make our stay wonderful. You cannot go wrong staying here if you are visiting Paris. We will surely return, as the flat was a wonderful part of our Paris memories. Great location in a quiet neighborhood but close to everything. Good to have air conditioning. Neither the dishwasher nor the television worked. Overall a very good apartment to rent! My family (of 5) enjoyed our stay at this apartment. The owner (Ludovic) was very responsive during the process. We had assistance available to us as needed (Choi) who was very knowledgeable and helpful. It is comfortable and the location is close to grocery stores and many amazing restaurants. We felt very safe in this neighborhood. The stairs were a bit bothersome with all of our luggage but a nice way to exercise. We had a great visit and enjoyed our stay. 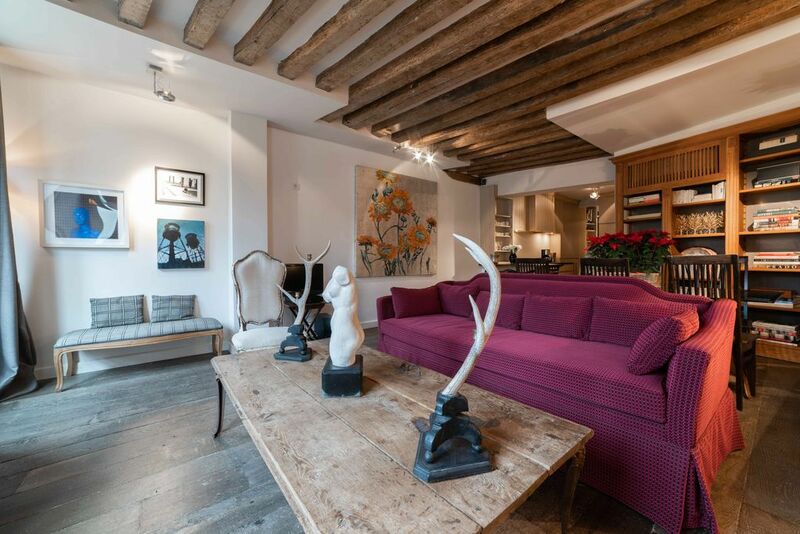 Beautiful, quaint Parisian home in a fantastic location. We had a great stay. We stayed for 4 nights with our two children and LOVED the location and feel of the apartment. The split bedrooms worked with one adult and one child in each. The neighborhood is quiet, prestigious, charming and the huge Windows that opened all throughout were incredible. We are so happy to not have chosen a hotel, and chosen the st Germain, Luxembourg location. The bedrooms are small, as typical in Europe, but the kids loved opening up the interior windows above the open courtyard and talking to each other across the space. Tennis og legeplads fundet i Jardin de Luxembourg, Svømmebassin til rådighed i Marche St Germain. Those rates are our lowest rates. Please contact us for an accurate quote which will vary depending on the length of stay, the time of year, etc. Best rates are for Sunday to Sunday stays. Rates include light cleaning twice a week and full cleaning at the end of the stay. Should you stay less than a week, you will get charge the cleaning fee. Rates above are applicable for four person occupancy. Each additional person staying in the unit will incur a charge of EUR40 per night. Families with two adults and three children will be exempt from this charge. To book the house, you need to pay 50% of the rental charges upfront. This 50% deposit is non refundable. The remaining 50% needs to be paid 4 weeks before check in day and is also non refundable once paid. Right before checking in, we require that you send us the security deposit (800 euros). This security deposit will be returned to you upon your departure so long as the apartment is in good condition.